Vaseux Lake, located between Okanagan Falls and Oliver on the Okanagan Highway, is home to a variety of wildlife and is a popular destination for outdoor enthusiasts. Like many BC lakes, however, Vaseux is in jeopardy due to a pretty, seemingly innocuous foe: the yellow flag iris. 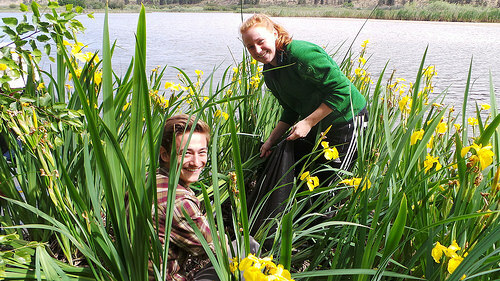 “Yellow flag iris is an aggressive ornamental water garden plant that is spreading rapidly, outcompeting native plant species and altering aquatic ecosystems across the Pacific Northwest,” explains Dr. Catherine Tarasoff of TRU’s Department of Natural Resource Sciences (NRS). She and her colleagues have developed a low-cost, environmentally friendly method to mitigate the spread of the invasive iris, and will conduct research at Vaseux Lake this summer to study its effectiveness. On Vaseux’s shoreline, the yellow flag irises grow rapidly in dense mats of rhizomes—subterranean stems which serve as the plant’s storage bank—that outcompete native plants, affecting a critical food source for migratory birds and local waterfowl. At five test sites around the lake, Tarasoff’s team has installed benthic barriers around plots of iris rhizomes. Sheet metal boxes, inserted in the sediment to enclose the rhizomes and prevent neighbouring healthy irises from growing into the plot, are topped with repurposed conveyor belts, a non-porous, rubber material that serves as the benthic barrier by blocking out light and air. Researchers developed the benthic barriers in collaboration with School of Trades and Technology faculty member Michael Grainger and his Metal Fabricating class, repurposing conveyor belts donated by LaFarge Canada. The concept is based on previous laboratory research that indicates that yellow flag iris cannot survive longer than 40 days under dark, anoxic (oxygen-depleted) conditions. The researchers will monitor rhizome vigour to compare the affect of these barriers with similar test plots where just the irises’ leaves have been removed, and control sites left untouched. The research received a $25,000 grant from Wildlife Habitat Canada to support the development of an economical method of controlling iris populations that would not harm the lake ecosystem. “This is such a great opportunity to gain research skills and hands-on experience in the field,” says Streichert, who is researching the irises this summer with a UREAP award. Developing an effective control technique for yellow flag iris requires an understanding of the Vaseux Lake environment as a whole. Working alongside Tarasoff are hydrologist Dr. Tom Pypker, aquatic invertebrate ecologist Dr. Brian Heise, and aridland plant ecologist Dr. Wendy Gardner. Dr. Brian Heise collects samples of the invertebrates at Vaseux Lake to determine what affect the benthic barriers may have on invertebrate populations, and thus on their predators. NRS researchers developed the benthic barriers in collaboration with School of Trades and Technology faculty member Michael Grainger and LaFarge Canada, who donated the repurposed conveyor belts. Tarasoff worked with Grainger and his first year Metal Fabricating class to design and construct the sheet metal boxes. This project will also enhance the skills of Bachelor of Natural Resource Science student Kailee Streichert. She has combined an Undergraduate Research Experience Award Program (UREAP) independent research project and a co-op placement to spend her summer on invasive iris research. 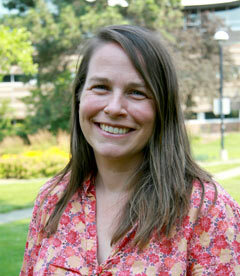 “This is such a great opportunity to gain research skills and hands-on experience in the field,” says Streichert. She will visit Vaseux Lake bi-weekly all summer to collect iris rhizome samples from the test sites, and analyze the samples in the laboratory. Vaseux Lake’s migratory birds, local waterfowl, fish and other wildlife like these basking turtles rely on indigenous plants and insect species along the lake’s rapidly changing shoreline. Field research will conclude at the end of August, followed by several months of data analysis. If the research shows the benthic barriers are effective, Tarasoff and her colleagues will test how the invasive irises respond to the barriers in other ecosystems with differing environmental conditions. Their method may have the potential to be used worldwide against invasive species. Since 1985, Wildlife Habitat Canada, a national, non-profit, charitable conservation organization, has invested over $50 million to support hundreds of conservation projects on private and public lands across Canada, through its granting program. Wildlife Habitat Canada works through partnerships with communities, landowners, governments, non-government organizations, and industry to conserve, enhance, and restore wildlife habitat. To learn more about the projects that Wildlife Habitat Canada has funded or to see our annual report, please visit www.whc.org. This project was undertaken with the financial support of the Government of Canada through the federal Department of the Environment.